The Best Senior blogs from thousands of top Senior blogs in our index using search and social metrics. Data will be refreshed once a week. 2.27 Sagora Blog - Real People, Real Living. 2.84 Arbor Lakes Senior Living | Embracing life. Enriching lives. Senior newsletter is a comprehensive summary of the day's most important blog posts and news articles from the best Senior websites on the web, and delivered to your email inbox each morning. To subscribe, simply provide us with your email address. Seattle, WA About Blog A Place for Mom's knowledgeable writers blog about senior living trends, aging and health news, senior housing and care tips, senior legal issues, and more. Facebook fans 311,820. Twitter followers 13,720. NYC and online About Blog Senior Planet is the first tech-themed resource for people 60-plus who are living and aging with attitude. Harness the power of technology to change the way we age. Facebook fans 14,894. Twitter followers 12,441. Seattle, Washington About Blog Find Assisted Living, Alzheimer's Care, Retirement Communities, and Home Care in our nationwide directory. Compare photos, maps, prices, amenities, and services offered. Facebook fans 1,157. Twitter followers 14,120. San Francisco, CA About Blog Read updated articles and discussion for those in their golden years. Facebook fans 1,129,033. Twitter followers 495,612. Cleveland, OH About Blog OnShift's web-based staff scheduling and labor management software is designed specifically for long-term care and senior living. Facebook fans 946. Twitter followers 536. Chicago, IL About Blog Senior Housing News covers news & trends on retirement, aging, independent living, Alzheimer's, skilled nursing, assisted living, dementia care & senior care. Facebook fans 1,926. Twitter followers 8,949. Louisville, KY About Blog Atria Senior Living is a forward-thinking provider of vibrant assisted living, independent living and memory care retirement communities. They create vibrant communities where older adults can thrive, participate & enjoy opportunities that help them keep making a positive difference in our world. Facebook fans 11,857. Twitter followers 1,702. Portland, Oregon About Blog The Senior List® is a community of boomers and seniors dedicated to helping each other age well. We're interesting in inspiring our community, and sharing the best products and services for aging adults. The latest senior discounts, medical alert reviews, caregiving solutions, dementia research and more. Facebook fans 10,797. Twitter followers 16,086. Northbrook, Illinois About Blog National media brand for owners, operators and other leaders in independent living, assisted living, memory care, senior living communities, continuing care retirement communities, life plan communities and other senior living settings. Facebook fans 260. Twitter followers 2,607. Wellesley, MA About Blog Assisted Living Today is a free resource for senior care information and to find senior housing. Get trusted information about elderly care and issues surrounding assisted living. Facebook fans 291. Twitter followers 798. Citrus Heights, California About Blog Senior Housing Forum is a website that is focused on providing current and relevant information and commentary on the senior housing industry. Facebook fans 551. Twitter followers 1,619. Clearwater, FL About Blog MedicareFAQ is a company that works hard to help individuals have a better understanding of all their health insurance options when it comes to Medicare. With all the choices available for Medicare coverage, we strive to help to make what can be a rather confusing and complicated sign up process easy and stress free. Check out our Medicare Supplement blog where we answer the most frequently asked questions regarding Medicare and Medigap! Facebook fans 1,759. Twitter followers 261. Gurgaon, Haryana, India About Blog SeniorWorld promotes positive ageing and provides Indian Seniors with products, services and engagement avenues, spanning health, lifestyle, tech and more. Facebook fans 153,348. Twitter followers n/a. Facebook fans 1,117. Twitter followers 881. 27. Sagora Blog - Real People, Real Living. Fort Worth, Texas About Blog Life at a Sagora Senior Living community revolves around modest luxury, personal freedom, and optimal health. Their mission is to provide caring environments that foster healthiness, safety and a high quality of life for every resident. Facebook fans 2,007. Twitter followers 447. Shelton, CT About Blog Everything you need to know about caring for your loved one - at home or at a senior living community. United Methodist Homes provides assisted and independent living housing and healthcare options in Farmington, Newington and Shelton, Connecticut. Their mission is to provide a continuum of services that supports health, independence, and dignity. Facebook fans 100. Twitter followers 5,121. Des Moines, IA About Blog Stay up to date on trends in senior living. The LCS Family of Companies is a leading provider of high-quality senior lifestyle products and services. Always serving the customer, first and foremost. Facebook fans 1,303. Twitter followers 221. Wolfeboro, New Hampshire About Blog You'll find an unsurpassed retirement lifestyle, the many advantages of this scenic location, and an unmatched financial guarantee. Enjoy burden-free, independent living at Sugar Hill Retirement Community, the only senior living cooperative in New Hampshire. Washington, DC About Blog Seniors Speak Out was created by the Healthcare Leadership Council’s Medicare Today as a resource for older Americans, caregivers and advocates to help ensure seniors have access to high quality health care. Working together to improve senior health, protect Medicare and advocate for older Americans. Minneapolis, Minnesota About Blog Our blog features resident stories, senior living trends, care and transition tips and resources and more. Walker Methodist specializes in lifestyle, housing and healthcare services for older adults. We own, operate and manage housing communities, provide rehabilitation services, and operate leading sub-acute transitional care centers that help people recover from hospitalizations or surgeries. Facebook fans 1,080. Twitter followers 535. Arizona, USA About Blog Sun Health provides comprehensive senior living services, charitable giving for local health care and community health programs that benefit residents with chronic disease and medication management needs. Facebook fans 282. Twitter followers 12. St. Louis, MO About Blog Learn more about Allegro Senior Living with assisted living, independent living and memory care communities in Florida and Kentucky. Facebook fans 3,099. Twitter followers 423. Metro Atlanta About Blog Dogwood Forest today for holistic Atlanta Assisted Living because a better living environment leads to a better life. Services include Memory Care, Dementia Care, Post Operative, Adult Day Services and more. Facebook fans 2,961. Twitter followers 235. UK About Blog Senior Chatters is a friendship only website that is dedicated to anybody over 50 who is looking to build genuine, worldwide friendships in a safe and friendly environment. Facebook fans 559. Twitter followers 50. West Palm Beach, FL About Blog Find senior resources on health, happiness, volunteering opportunities, how to remain active as a senior and senior housing news. Luxury retirement living on the waterfront with 3 different levels of resort-style senior homes: independent living, assisted living and skilled nursing. Portland, Oregon About Blog Radiant Senior Living provides a family of services to meet the housing and health care needs of seniors at every stage of life. Their mission is to create and sustain comfortable, caring environments for those who depend on us. Facebook fans 359. Twitter followers 353. Cincinnati, OH About Blog Episcopal Retirement Service (ERS) has dedicated itself to improving the lives of older adults through innovative, quality living environments and in-home and community-based services delivered by experienced and compassionate professionals. ERS also operates in-home services such as their geriatric care management service, Living Well Senior Solutions. Facebook fans 402. Twitter followers 528. PA, MD, VA About Blog Read the latest IntegraCare news for all our communities and follow our senior living tips. IntegraCare is a trusted leader in senior living with 10 communities offering assisted living, independent living, Alzheimer's care, and dementia care. Facebook fans 367. Twitter followers 1,700. Norwood, MA About Blog LCB Senior Living, LLC is a developer/operator and third-party manager of quality senior housing communities. Since 1994, the LCB team has been pioneers in modern senior living, providing Independent Living, Assisted living and Memory Care services throughout New England and the eastern United States. Charlottesville, VA About Blog Commonwealth Senior Living provides independent living, assisted living and memory care. Our goal is to provide quality care to our elderly population in a non-institutional, home-like atmosphere. We strive to improve the lives of seniors, their families and each other every day. Facebook fans 1,979. Twitter followers 217. St. Paul, MN About Blog Lyngblomsten is a Christian nonprofit organization serving older adults and their families through healthcare, housing, and community-based services. Influenced by Christ, Lyngblomsten provides a ministry of compassionate care and innovative services to older adults in order to preserve and enhance their quality of life. Facebook fans 666. Twitter followers 351. Baltimore, Maryland About Blog Springwell Senior Living provides high quality senior care in Baltimore, Maryland with independent and and assisted living services. At Springwell, every resident is treated with the utmost respect and dignity and receives the highest quality of care and service. Ireland About Blog Senior Times organises 50 PLUS EXPO (formerly Over50's Shows) in Cork, Dublin, Galway, Kilkenny. Senior Times publishes Senior Times magazine. Get articles on Senior TImes, Older, Mature, Active, Over 50, Senior, Lifestyle, Retired, Active Retired, Looking to retire, Retiring, Retirement. Facebook fans 3,251. Twitter followers 1,210. Colorado Springs, CO, USA About Blog Bethesda Senior Living Communities is a faith-based not-for-profit organization headquartered in Colorado Springs, operating 16 campuses around the country. Our vibrant communities offer independent living, assisted living, and memory care for seniors in warm, home-like atmospheres. Facebook fans 272. Twitter followers 165. San Diego, CA About Blog St. Paul’s Senior Service’s senior care blog gives you practical information with tips tailor-made for life. Our San Diego senior care blog offer’s insight into senior health and news, along with tools to help seniors stay as healthy and independent as possible. We offer senior care options including assisted living, assisted care, memory care, nursing care, independent living, senior housing etc. Facebook fans 921. Twitter followers 4. Austin Houston Amarillo Frisco About Blog Read helpful articles for caregivers or loved ones of those living with Alzheimer’s disease or other memory disorders. Our residential facilities are a good option for those living with dementia. Facebook fans 247. Twitter followers 22. Lombard & Elmhurst, Illinois About Blog Lexington Square's resource for independent living, assisted living, and memory care information for senior living in the Chicago area. Facebook fans 2,445. Twitter followers 327. Montreal, QC About Blog The Senior Times is a monthly newspaper in Montreal that covers topics of interest to people of all ages, with a focus on those over 50. Facebook fans 307. Twitter followers 248. Queens NY About Blog At Castle Senior Living, we work hard to ensure our residents and families have a positive experience. Castle Senior Living at Forest Hills, specializing in Assisted Living and Trial Stays in Forest Hills, New York. Read our blog for more information! Edmonds, WA About Blog Senior Living Link is an innovative company that provides the newest way to search for senior housing. Their mission is to be your primary and only source for researching a perfect home with direct access to senior living facilities. Their goal is for you to start and end your cumbersome task of finding that perfect home using Senior Living Link. Facebook fans 2,668. Twitter followers 1,454. Alpharetta, Georgia About Blog Oaks Senior Living communities are staffed with professionally trained caregivers, selected for their knowledge, compassion and understanding of residents’ needs. Facebook fans 266. Twitter followers 235. Rockford, Illinois About Blog Extraordinary senior living can be a part of your every day in a Wesley Willows community located in Rockford, IL between Chicago, IL and Madison, WI. They promote active, secure lifestyles for seniors through ongoing, personalized care. San Francisco About Blog Generations Beat Online is the e-news for the Journalists Network on Generations. Las Vegas, Nevada About Blog We provide medication management and assistance with bathing and daily living activities. Our person-centered care anticipates wellness and comfort while validating seniors. Birmingham, Alabama About Blog The Atlas Senior Living mission is to build a premier senior housing company through ownership and third party management that focuses on maximizing revenue drivers and operational efficiencies by allowing individual resident needs and preferences to drive service offerings and by focusing on resident and employee satisfaction. About Blog Looking for best Electric Wheelchairs, walkers and Oximeters for Seniors, RideWithEase.com can help you find the best mobility scooter on the market to assists them. Florida, USA About Blog Stay up-to-date on Grand Oaks assisted living blog. Grand Oaks offers exceptional Senior Living Communities, Assisted Living Facilities, Independent Living, Alzheimer’s Care & Skilled Nursing Care. Facebook fans 214. Twitter followers 10. Austintown, Ohio About Blog At Woodlands, we take pride in offering premium services and facilities to seniors in Austintown and Poland, OH and surrounding areas. Learn how our senior services meet the needs of each individual resident, to provide the highest level of senior care and comfort. Escondido, CA About Blog Felicita Vida is a beautifully designed independent, assisted and memory care community located in North Escondido. Their intention is to make Felicita Vida Senior Living a comfortable, personalized fit. Timonium, Maryland About Blog Senior Helpers was founded by Tony Bonac. Their mission is to ensure a better quality of life for our elderly clients and their families by providing dependable and affordable care. It is a trusted and respected organization that takes a responsible role in supporting our clients and their families, our employees, and our community. Facebook fans 27,623. Twitter followers 8,878. Chicago, IL About Blog The latest posts in our Senior Living Experts Blog. Our team of experienced advisors provide personalized help finding the best assisted living in Chicagoland. Facebook fans 766. Twitter followers 8,604. Columbia MO About Blog The Village of Bedford Walk is Columbia, Missouri's newest, senior living community. The Village of Bedford Walk offers abundant amenities including concierge services, a daily chef-prepared meal, scheduled transportation, wellness programs and a wide variety of scheduled activities. About Blog Improve mobility and wellness of elderly and people with disability. If you are looking for useful information about walking aids, sleep apnea treatments or any other things related to seniors and people with disabilities. We are here to offer you some help. About Blog At 72 years of age, I am now in my 7th Decade. That time has given me lots of experience with exercise and nutrition. Now I want to help you sort through the clutter of misinformation and to make sense of what's good and valuable in a simple, easy manner. Seattle, Washington About Blog This blog is dedicated to helping those interested in elder care and retirement community information in West Seatte. Facebook fans 233. Twitter followers 63. Falls Church, VA About Blog The Kensington Falls Church is an assisted living and memory care residence located in the heart of northern Virginia, in the "Little City" of Falls Church. Facebook fans 166. Twitter followers 36. Mesa, AZ About Blog The Grand Court of Mesa is an Independent Living, Assisted Living Center and Memory Care Community. At The Grand Court Mesa, you'll find all the amenities and services needed to design a unique lifestyle plan that fits your needs and wants. 84. Arbor Lakes Senior Living | Embracing life. Enriching lives. Maple Grove, MN About Blog Arbor Lakes Senior Living is a comfortable apartment community featuring options of independent living, assisted living, and memory care in Maple Grove, Minnesota. Franklin, TN About Blog Read the latest guidance on senior living, assisted living, memory care, nutrition, and much more from the experts, LPNs, RN, and team at Traditions. At every traditions community, our residence find a passionate staff and caring senior community offering safety, tranquility, security and a home. Port Coquitlam About Blog This blog is for those who are interested in what life after retirement may look like for them. In this blog the author highlights and write about issues that he believe to be important both for Seniors and working Boomers. Seattle, Washington About Blog We provide community home living for seniors wishing to enjoy a family-style life, but have their medical and safety needs met in a warm, welcoming environment. Our three homes are in the Seattle/Shoreline area. Sioux City About Blog Welcome to our Senior Living Blog. You'll find updated information on Independent Living, Assisted Living and Memory Care. Our mission is to see a better picture of what life is like at Whispering Creek. Facebook fans 328. Twitter followers 10. California, USA About Blog Valley Home Care is a locally owned company founded by professionals in the medical community who take pride in offering services geared specifically to allow seniors to reside comfortably in their home. Read senior care news and updated for the entire Fresno area. Facebook fans 384. Twitter followers 160. Deephaven, Minnesota About Blog Deephaven Woods Senior Living offers Senior Apartment Rentals, Assisted Living, and Memory Care apartment homes, as well as Care Suites in the heart of Deephaven, Minnesota. Omaha, NE About Blog Find updated information on Independent Living, Assisted Living and Memory Care at our Omaha Community. Fountain View is designed to provide a beautiful home for residents, while offering the care and services needed to maintain an active and quality lifestyle. Facebook fans 239. Twitter followers 270. Edina, MN About Blog Aurora on France in Edina, MN offers a variety of senior living options including memory care in a beautiful setting. Pennsylvania, USA About Blog Keep informed on the latest private duty home care services offered by At-Home Quality Care. We offer high quality at home care for seniors. Our mission is to relieve stress, strengthen independent living and enhance quality of life. Facebook fans 830. Twitter followers 1,957. PA, NY and CO About Blog Stay updated on senior living news and research within the retirement living industry on our blog from our team of senior marketing and advertising consultants. Varsity is a senior living marketing and sales consulting agency focused on occupancy for retirement communities, CCRC, assisted living facilities and more. Facebook fans 112. Twitter followers 1,394. Brighton, New York About Blog Friendly Senior Living is a non-profit, non-denominational nursing care and rehabilitation facility. The Friendly Home provides nursing care, rehabilitation and related services that enhance the quality of life for older adults, and is committed to being the provider and employer of choice, continuing a tradition of not-for-profit service to the community. Facebook fans 445. Twitter followers 364. Town 'n' Country, Florida About Blog Get senior living insight from the experts at After55.com, including senior housing guidance, retirement advice, senior finances tips, and senior life news. Facebook fans 1,587. Twitter followers 683. Huntsville, Alabama About Blog Read our Blog to follow up on new imformation. The Cottage management team dedicates its energy into achieving the quality of life goals of its residents and their families. Our mission is to provide exceptional care and service to our residents, families, and communities by promoting resident individualism, choice, and personal dignity in a comfortable, home-like environment. Facebook fans 254. Twitter followers 317. Chapel Hill, NC About Blog All About Seniors is the first full-sized comprehensive directory of Senior-related services in the SC Upstate, Charleston, SC and Charlotte, NC designed to provide you with all of the resource information that you need to get the answers and direction that you need. Get resources for assisted living, retirement communities, senior housing, nursing homes and services. Facebook fans 1,649. Twitter followers 5,633. Gurnee, IL About Blog BrightStar's home care blog is full of information and resources. Read our senior living blog so you can make the right decisions for your home care needs. Facebook fans 12,012. Twitter followers 2,159. Saint Louis, MO About Blog At Cedarhurst Living, we offer Independent Living, Assisted Living and Memory Care for seniors. Learn more about how Cedarhurst is Designed for Living. Kissimmee, Florida About Blog Stay up to date with the Bella Vita blog. Our blog is updated with senior living, Italian lifestyle, and Florida retirement community resources and topics! Cleveland, Ohio About Blog Assisted-living and nursing home senior care environment news and information for nurses, continuing-care providers & directors. Learn about design and management of independent living communities for the elderly, environments for aging and accountable care organizations as well as hospice services and healthcare information technology for retirement facilities. Read about Alzheimer’s and dementia care. Facebook fans 9,922. Twitter followers 880. 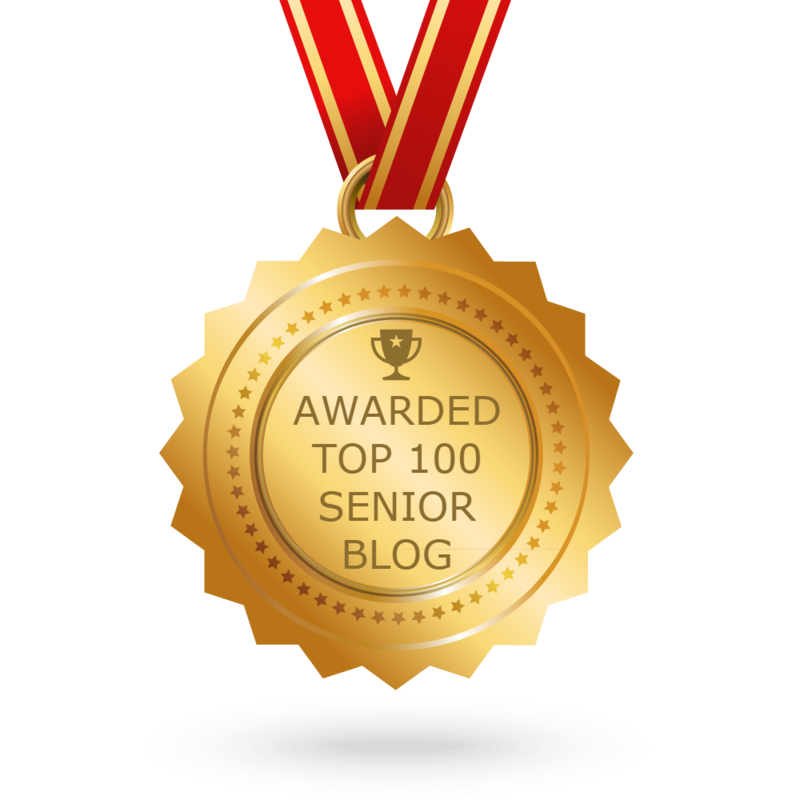 CONGRATULATIONS to every blogger that has made this Top Senior Blogs list! This is the most comprehensive list of best Senior blogs on the internet and I’m honoured to have you as part of this! I personally give you a high-five and want to thank you for your contribution to this world.